Seattle is a great road trip destination. It’s a beautiful city with a lot to offer, and very little snow during the winter. It’s a mere two-hour road trip for us to reach Seattle, so we come here often. The city seems to have a little something for everyone. If you’re big into coffee and local cafes, Seattle is the place. Places like Victrola Coffee and Zoka Coffee are among our favorite coffee shops in the city, brewing up delicious coffee and are often jam packed with other coffee lovers. The very first Starbucks location is in Seattle (Pike Place Market). It’s a popular tourist stop for Starbucks lovers, and it’s kind of unique to visit the original store; it’s like going back in time. The original location is quaint and really gives you a glimpse of what Starbucks was like when it first opened. This historic market has a lot to offer. Being a tourist, it’s amazing just walking through this busy farmers market and seeing tables full of colorful flowers and piles of fresh seafood. It’s also entertaining to watch the local vendors tossing fish around at the Pike Place Fish Company. We often visit the market for some fresh fruits and vegetables while road tripping through the city. Road Trip Tip: If you’re looking for a quirky/off-beat attraction while in town, you can find the gum wall in the Pike Place Market. The gum wall is essentially a place where many discard their old gum on a wall; it’s now turned into a big tourist draw and sort of a work of art in its own right. Seattle is full of unique attractions, and the Fremont Troll is one of our favorite. This is a two-story troll constructed under a bridge just outside the Seattle city center. The troll was created by local university students as an art project. It’s pretty magnificent to see a massive troll under a bridge, and makes for a great photo op. This is the perfect place for a rainy day of exploring. Seattle has an impressive collection of European paintings, Native America carvings and ancient Asian artwork on display at the Seattle Art Museum. Grab some coffee and take a stroll through the Olympic Sculpture Park, where you’ll find 20+ massive sculptures around the park. It’s an awe-inspiring park that’s well worth checking out. We actually stumbled across this park while wandering the city. There’s an impressive collection of sculptures here. Seattle has some unique history with its underground passageways. Years ago, Pioneer Square caught fire. When it came time to rebuild, the city chose to rebuild on higher ground due to frequent flooding. Parts of the old city still remain, and there is now and old underground walking tour that you can take in Seattle. I’ve yet to do this, but I watched a very interesting documentary on the rebuilding of the town and have added this to my bucket list for the next time we’re in Seattle. The Seattle Aquarium is well known as being one of the more impressive aquariums across the country. There’s a massive octopus on display, huge jellyfish tanks, and even some very cute seals. You could spend an entire day at the aquarium discovering the different sea creatures that live here. I’ve put the space needle on this list because it’s such an iconic figure for the city of Seattle, but to be honest, I didn’t find the space needle to be that exciting. If you’ve never been to Seattle before, this might be a great way to view the city. You’ll get beautiful views of the surrounding mountains, city center, and harbor below. I guess it didn’t do much for me because I’ve been to Seattle several times before by the time I went up. There are several interactive screens in the space needle with great information about the city, but I didn’t find it worth $19. Travel tip: if you’re planning on visiting Seattle during the spring time, bring a rain coat and boots. Seattle seems to get the same weather as Vancouver; very little snow but lots of rain. Have you been to Seattle before? 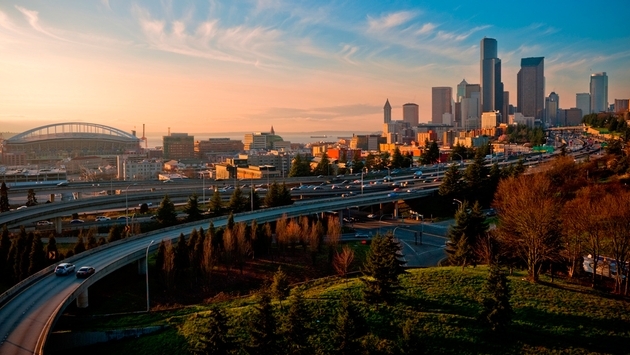 What’s your favorite thing to do in Seattle?